The cusp is the pointed or rounded projection on the chewing surface of the tooth. Molars typically have four cusps as shown by the four purple asterisks in the top image. Bicuspids, also called pre-molars, typically have two cusps as shown by the two blue asterisks in the top image. When we refer to crowns, onlays, and inlays, we are referring to whether we need to restore the cusp of the tooth, and if so, whether it is all of the cusps or some of the cusps. When a tooth has been severely weakened or fractured, we will usually place a crown, which covers all of the cusps. In the photo on the right, the closest tooth requires a crown to made in the lab and the result is shown in the bottom picture. When a tooth has one or more cusps that are weakened or fractured but other cusps that are still strong, we can elect to do an onlay. 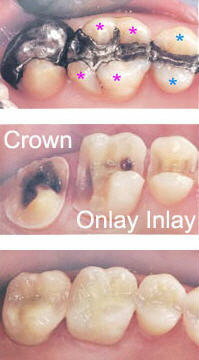 An onlay can cover one or more cusps while retaining some of the tooth above the gumline. In the example on the right, the lower left cusp for the middle tooth was determined to be too weak. It was capped, but the remaining three cusps were healthy so they were left untouched. The porcelain restoration was made in the lab and the final result is in the bottom image. When the cusps of the tooth are all healthy and structurally sound, we can elect to restore the surrounding structure but leave the cusps intact. This is called an inlay as shown by the tooth on the far right. The amalgam restoration needed to be replaced and it was restored with a porcelain inlay that was made in the lab. The final result is shown in the bottom image. Please see the Crowns Gallery and the Fillings Gallery to view the types of results we can achieve with crowns, inlays, and onlays. "Best dental experience I have ever had! Keep up the great work." "The staff were very thorough, helpful and friendly. The facilities were clean, and everything was explained before it was done."